As both Shrove Tuesday (aka pancake day) and valentines day fell in the same week this year we decided to make some heart shaped pancakes to celebrate! Ben and Elizabeth went for chopped plum, whipped cream and sprinkles!! What else? Heat the other side for around a minute, then pop on to a plate and repeat 7 times. 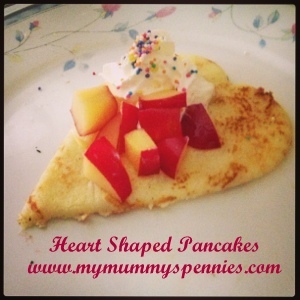 Use a heart shaped cookie cutter to cut your pancakes down to size, add on the toppings of your choice, and ENJOY! Happy Valentines / Shrove Tuesday!! 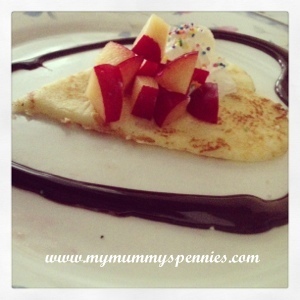 Why not click on the badges below to find more yummy recipes? ahh so you cut after youve made, thats why I melted a a cookie cutter last year! Thanks for linking up.. I love pancakes, they're so yummy. I'm a bit of a rebel (my Jenny Craig consultant would kill me) and we quite often have them on weekends. Nipping over from Cook It, Blog It. Oh my what is the topping cream and hundreds and thousands? Genius!